But what about when we don’t have a candidate gene in mind? This is a much more common situation, especially when we’re studying organisms like Joshua tree, which haven’t had much in-depth genetic analysis yet. Well, what we can do then is to conduct the same kind of test at many places across the whole genome — the more, the better. Genome-wide association (GWA) study work by collecting DNA sequence data from thousands or millions of variable loci in the genome, and comparing the variants at each of those places to the phenotypes of the individuals carrying those different variants. The handful of loci that show the strongest associations with the phenotype are, we understand, most likely to be within or close to genes that contribute to the measured phenotype differences. Modern genome sequencing makes it easier than ever to collect the genetic data necessary for a GWA project, but it’s still not simple to do one rigorously. First, you can’t quite just sequence and measure a bunch of Joshua trees and perform the kind of simple test I cartooned in Figure 1. 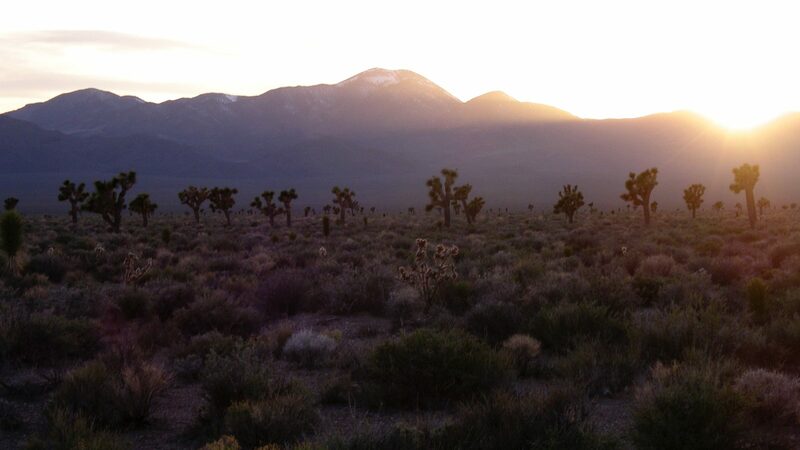 In natural populations, we have to contend with a phenomenon called isolation-by-distance (IBD), which means that Joshua trees from different populations will likely differ at some points in the genome simply because they come from different populations. When you test millions of places in the genome, you’ll likely find some of those differences that have everything to do with IBD and nothing to do with the phenotype, so it’s necessary to use a statistical test that accounts for IBD. Second, even when you account for confounding population genetic effects, an association test is fundamentally correlational — it doesn’t directly demonstrate that the different genetic variants at an associated site actually create the phenotype differences you’ve measured. So a single GWA study needs to be connected to other results, from different kinds of experiments, to confirm that genes showing associations to a phenotype in one context show associations, or even direct effects, in other conditions. Ecological geneticists call this process of comparing different kinds of evidence for a gene’s effects “triangulation”. Finally, to be as useful as possible, a GWA study needs a reference genome to provide context to its results — whether associated loci lie in genes, and what those genes might do. It’s possible to do association testing without a reference, collecting sequence data in such a way that you know individuals’ genotypes at many loci, but don’t know where those loci are with respect to each other in the genome. Sometimes you can still use this approach to determine that an associated locus is similar to a stretch of genetic sequence known to be a particular kind of gene in another, closely related species. More often, though, GWA without a genome results in a list of associated loci about which very little is known beyond the fact that they’re associated with the phenotype you measured. Building up the genomic resources and experimental knowledge base required to support good GWA can take decades, but the Joshua Tree Genome Project’s collaborators bring together the range of expertise necessary to do it in the course of a four-year NSF-sponsored project. We’ve carefully planned our sampling design and statistical analysis to control for confounding population genetic effects. We’ll perform controlled experiments in Joshua tree physiology and gene expression to help “triangulate” the importance of climate- and growth-associated loci. And, first and foremost, we’re building a carefully annotated reference genome to provide context for GWA results. It’s going to be a lot of work, but it’s what we need to do to confidently identify the genes that help Joshua tree cope with extreme climates.